KENNEDY SPACE CENTER, FL--Astronauts Andrew Feustel and Michael Fincke suited up for a planned six-and-a-half-hour spacewalk Sunday to top off the ammonia coolant in one of the International Space Station's solar arrays and to lubricate a massive solar array drive mechanism to reduce long term wear and tear. The excursion was scheduled to begin around 2:16 a.m. EDT (GMT-4) when the astronauts switch their spacesuits to battery power. For identification Feustel, call sign EV-1, is wearing a suit with red stripes while Fincke, EV-2, is wearing a suit with no markings. This will be the 157th spacewalk devoted to space station assembly and maintenance since construction began in 1998, the sixth so far this year and the second of four planned by the Endeavour astronauts. It is the fifth spacewalk overall for Feustel, veteran of the most recent Hubble Space Telescope servicing mission, and the seventh for Fincke, who conducted six EVAs during earlier long-duration stays aboard the station. The primary objective of Sunday's EVA is to route about five pounds of ammonia through a long multi-section hose stretching from a tank near the center of the station's power truss to the left-side outboard set of solar arrays, known as P6. About 55 pounds of ammonia circulate through radiators on each set of arrays to cool internal electrical components and P6 has a small leak somewhere in its coolant system. 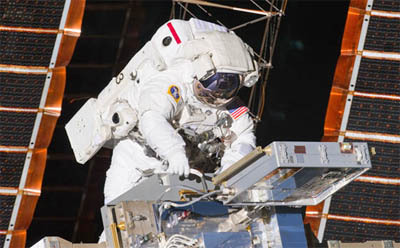 During a spacewalk Friday, Feustel and astronaut Gregory Chamitoff hooked up hose segments and jumpers across truss segments to complete the line needed to reach P6. One set of jumpers was then disconnected to allow the left-side solar alpha rotary joint, or SARJ, to rotate normally so the P4 and P6 radiators could track the sun as required. The port SARJ will be stopped and the jumpers reconnected for the ammonia top off. It will take about 10 minutes to recharge the P6 coolant system. After that, Fuestel will vent the line with nitrogen to remove any residual ammonia. Two ventings are required, one lasting 17 minutes and one about four minutes. NASA has a history of problems with ammonia quick-disconnect fittings, and there are more than a half-dozen connections required for the P6 radiator fill. If either spacewalker gets ammonia on his suit, NASA will implement a "bake out" protocol to make sure any ammonia ice crystals sublimate away before the astronauts re-enter the space station. "This isn't your household cleaner ammonia," Fincke said, "this is high-grade industrial ammonia so we have to be super careful not to get it on us or to spill it because it's quite dangerous if we brought it back inside. But we're going to recharge the ammonia lines. ... There's a series of jumpers that we have to go across, including the rotating solar alpha rotary joint, so we have some jumpers, a series of hoses that will fully charge our ammonia system. "While Drew's doing that, I get to do a lubrication job, add some grease, some Braycote, to our solar alpha rotary joint," Fincke said. "We found the original design had some extra friction that we weren't expecting and it started to grind our joint (on the right side of the station). So since then, every couple years, (we've) started to add some grease on it and it rotates great. However, we won't have that ability so much in the future, so while Drew's working with the ammonia system I'll be lubricating the outside of the (left-side) solar alpha rotary joint so it can last another five to ten years, no problem." When the SARJ work is complete and the astronauts have verified that all tools, tethers and jumpers are inboard of the port SARJ, commands will be sent to rotate the solar arrays through 200 degrees. The 45-minute procedure will spread the grease already applied and bring the other side of the gear and race into position for lubrication. While the array is slowly rotating, Feustel will install a lens cover on a camera used by the Canadian Special Purpose Dexterous Manipulator, or Dextre, a robot arm attachment fitting that in some cases can take the place of a spacewalking astronaut. With the lens cover in place, Feustel plans to lubricate the snares used by Dextre to hold components in place. Fincke, meanwhile, will install two grapple bar stowage beams that will provide a temporary mounting point for radiator panels if replacement operations are ever required. Finally, Fincke and Feustel will apply a final bead of grease to the SARJ race ring before re-installing six covers and heading back to the airlock. Because of the possibility of ammonia contamination, "we've got the procedures in place such that we will decontaminate the EVA crew once they get inside the airlock," said Flight Director Derek Hassmann. "We've got (sensors) that will monitor the amount of ammonia in the atmosphere. So we feel comfortable going forward with the EVA with the understanding that if we do get contaminated with ammonia, which is possible, we understand how to clean the crew up and keep them safe once they come inside."